Barite Market size was more than USD 2.2 billion in 2016 and will witness 6% growth over the projected timespan. Strong product demand is ascribed to its extensive application as a weighing agent in the oil & gas drilling industry. Pressing need to meet energy demand across various end-user industries including petrochemicals, aviation, etc. will result in rising oil & gas production which in turn will have positive impact on the barite market size during the forecast period. Primarily, the U.S. shale boom has propelled product demand for its application as weighing agent in the oil & gas drilling sector. It is used to increase the density of the fluid to control the pressure from the shale reserves. The U.S. oil shale production was approximately 500 thousand barrels per day in 2010 and has reached over 3,100 thousand barrels per day in 2016. This trend is likely to continue during the forecast period which will subsequently drive the market growth in the U.S. Furthermore, there is no feasible product substitute to impede barite demand in the region and henceforth will show positive growth indicators over the projected time spell. Escalating product demand in paints and coatings industry in Asia Pacific is likely to make prominent contribution to the product market size by 2024. This is due to its versatile characteristics including ability to impart high brightness, low oil absorption, inert nature which makes it desirable to be used in pigment for paints & coatings industry. Asia Pacific paints & coatings industry is mounting swiftly owing to increasing demand from various end-user industries including automotive, consumer goods, etc. which will subsequently have positive influence on the product market size over the projected timeframe. Limited geographical presence along with excessive cost involved in transportation is likely to hamper barite market size in the coming years. In addition, availability of several substitutes including ilmenite, galena, celestite, and hematite can also be used as drilling mud (weighing agent) in the oil & gas industry which is probable to impede market size during the forecast period. Furthermore, new oil exploration methods have reduced the need for wells and boreholes, which will curtail the demand for drilling mud by 2024. 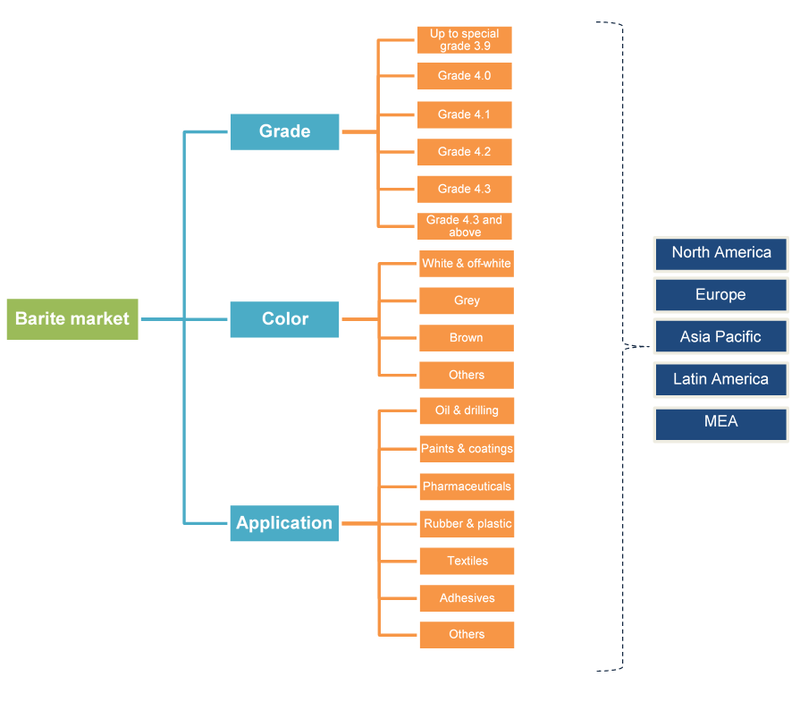 Grades above 4.3 barite market size is likely to grow at a CAGR close to 3% owing to rapidly growing rubber, plastic, paints & coatings industry in the near future. The grade represents the specific gravity of barite and higher grades are of superior quality (due to their increased BaSO4 content) compared to grades with lower specific gravity. In addition, higher grade barite is attained from deeper earth crust and henceforth is priced higher than lower grade barite and is likely to make prominent contribution to market size in the coming years. Lower grade barite including grade 3.9 to grade 4.2 finds application in oil & gas drilling industry. Grade 4.2 is considered optimum for oil & drilling application as per the American Association of Drilling Engineers. Rapid pace of shale gas production in the U.S. due to abundant reserves availability along with dire need to shift industry focus to unconventional energy sources has propelled grade 4.2 demand as weighing agent which in turn will have positive impact on the barite market size in the coming years. White & off-white barite market size is anticipated to grow at a CAGR close to 3% by 2024. It finds extensive application in the paints & coatings industry which will help generate promising gains during the forecast period. Paints & coatings demand is likely to propel in Asia Pacific due to rising massive construction spending in the region, which will subsequently have positive influence on the market size by 2024. Other product color includes yellow, blue, orange, etc. which finds widespread applications in the oil & gas drilling, paints & coatings, pharmaceuticals, rubber industry, adhesives, etc. Strong growth indicators in the aforementioned industries will help generate protruding gains to barite market size in the coming years. Barite market size for oil & drilling is expected to grow at a CAGR close to 4.5% in the coming years. This is credited to shale gas boom in the U.S. and China, which has resulted in rising drilling & production activities to meet energy demand and reduce oil dependency from the middle east. This trend is probable to make significant contribution to market size in the coming years. In addition, the product market for pharmaceuticals finds widespread applications as diagnosis materials for stomach & intestine as well as for filling plaster to extend its time limit. Global barite market size for paints & coatings is projected to grow at a CAGR of over 3.5% in the coming years. This is due to rapid pace of paints & coatings industry which is attributed to strong urbanization and industrialization primarily in the emerging economies. Furthermore, barite market size for rubber & plastic is anticipated to grow at a CAGR close to 3% owing to positive growth indicators in the automotive industry primarily in the Asia Pacific due to improving socio-economic factors. Asia Pacific barite market size is the fastest growing segment and is anticipated to grow at a CAGR of over 7% during the forecast period. This is primarily due to large amount of shale reserves available in China to meet energy demand across various end-user industries including power, automotive, etc. in the region. For instance, China accounts for over 720 billion tons of shale resources which are likely to be produced in the coming years and henceforth will drive market by 2024. Furthermore, rapid industrialization and urbanization has led to strong growth indicators in the paints & coatings industry which will further boost the regional barite market size over the projected time spell. North America market size was valued over USD 1 billion in 2016. This is credited to the shale gas boom which has led to increased demand as weighing agent in the oil & gas industry. In addition, shifting market focus to use unconventional energy sources to meet demand across various end-user industries including automotive, power, household, etc. has led to rising product demand by 2024. Key barite market share contributors are Spectrum Chemical Manufacturing Corporation, Deutsche Baryt Industrie, Halliburton, CIMBAR Performance Minerals, New Riverside Ochre Company, Inc., Excalibar Minerals LLC, and Anglo Pacific Minerals. Additionally, the global barite industry share was consolidated in 2016 as key players in the business accounted for over 55% of the business share in the same year. The key players in the industry are making heavy investments to upgrade its plant facilities to enhance production capacity and attain competitive advantage in the business. For instance, CIMBAR Performance Minerals completed USD 6 million upgrades in its two plants located in Houston, Texas and Wellsville, Ohio in 2014. The upgrade and expansion of these ISO certified facilities resulted in an overall increase in production capacity up with 400,000 tons annually. Barite is used as a weighing agent across oil & gas drilling industry to increase the density of the fluid to control the pressure from the shale reserves. The product also finds extensive applications across various end-user industries including paints & coatings, rubber & plastic, pharmaceuticals, adhesives, textile, etc. The product is available in various grades including unto sp gr 3.9, grade 4.0, grade 4.1, grade 4.2, grade 4.3 and grades above 4.3 based on the variations in specific gravity. The specific gravity grade 4.2 is extensively used in oil & gas drilling industry while grade 4.3 and above is primarily used in paints & coatings industry, rubber & plastic, etc. In addition, product availability in assortment of colors including white & off-white, grey, brown, etc. which is due to impurity presence and finds varying applications based on their physical attributes. North America contributes a significant portion to the barite market size owing to the U.S. shale boom along with shifting market focus to increase dependency on unconventional energy source.